What is the Surface of Saturn Like? 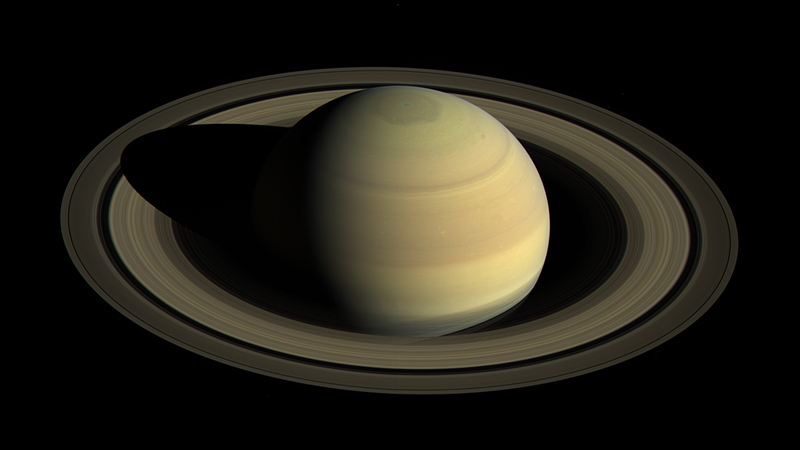 Saturn is a ball made up almost entirely of hydrogen and helium. The density and temperature changes the deeper into the planet you go, but Saturn can’t be said to have a solid surface. If you tried to walk on the surface of Saturn, you would fall into the planet, suffering higher temperatures and pressures until you were crushed inside the planet. But Saturn appears to have a surface, so what are we looking at. The outer atmosphere of Saturn consists of 93% molecular hydrogen and the rest helium, with trace amounts of ammonia, acetylene, ethane, phosphine and methane. It’s these trace amounts that create the visible bands and clouds that we see in pictures of Saturn. There are three main regions in Saturn’s troposphere – the part of the planet where weather is actually occurring. These three regions are completely defined by the temperature at which droplets condense into vapor and form clouds. The top visible cloud deck is made up of ammonia clouds and is found about 100 km below the top of the troposphere, in a region called the tropopause. Below that is a second cloud deck of ammonium hydrosulphide clouds. And below that, where temperatures are 0-degrees C, there are clouds of water. Of course you can’t stand on the surface of Saturn, but if you could, you would experience about 91% of Earth’s gravity. In other words, if your bathroom scale says 100 kg on Earth, it would only say 91 kg on Saturn. We have written many articles about Saturn for Universe Today. Here’s an article about patterns in Saturn’s atmosphere, and here’s a nice picture of Saturn’s clouds in silhouette.